Slowly over several weeks, I have been collecting unusual rocks. All found at Westport Beach. On a cliff ledge they now look out to sea. My homage to Tim Burton and his wonderful characters. I like the heart rock and the face one. The oval one in the middle looks very much like a face. Nice collection. Miss you like an old friend, Cee. Really enjoy hearing from you. 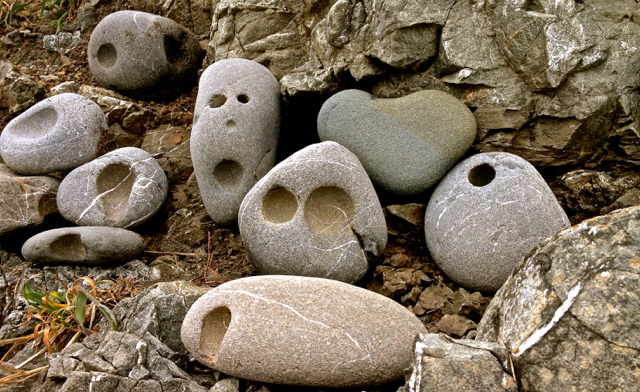 I love Burton…and your rocks! Every time I walk the beach, I can look over at the cliffside and see them. I agree with Sher, it does look much like a face! I wonder what caused those pits to occur. There once were harder rocks embedded; mostly agates. As these gray rocks wore down, the agates were freed. Hence, the pits.